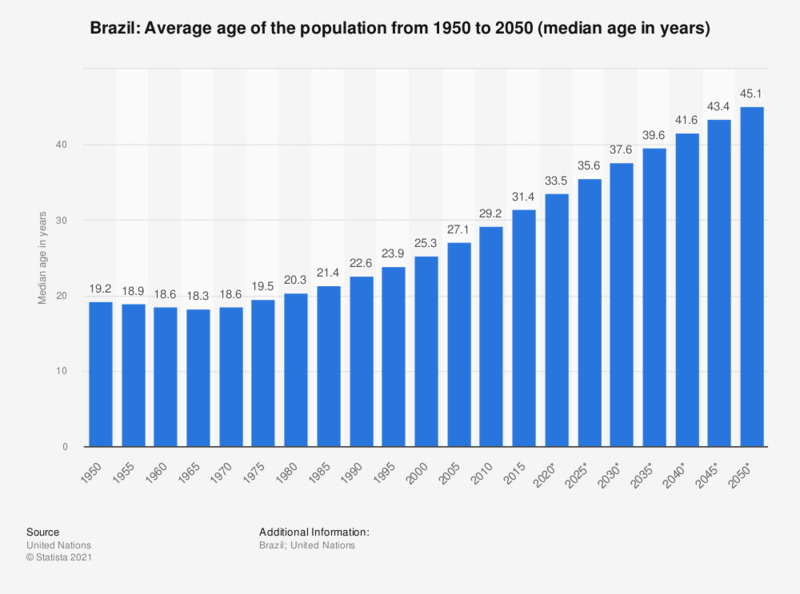 This statistic shows the median age of the population in Brazil from 1950 to 2050. The median age is the age that divides a population into two numerically equal groups; that is, half the people are younger than this age and half are older. It is a single index that summarizes the age distribution of a population. In 2015, the median age of the Brazilian population was 31.3 years. The average age of the Brazil’s population has risen from a low of 18.2 years in 1965 to 31.2 years in 2015, a typical change in developing nations, and other demographic parameters support this trend: As of 2014, the share of children under 14 years of age stood at around 23.5 percent, a great improvement from earlier times. Since 2005, the fertility rate has also dropped significantly, but now it is even lower than the natural replacement rate at 1.78 children per woman. Over the same period of time, life expectancy has also risen to 74.4 years of age - higher than the average for developing nations. These changes typically happen as a result of developing countries becoming more modernized and economically diverse. Brazil’s economy had been getting significantly stronger and per capita GDP peaked in 2011 at a much higher value than the regional average for Latin America and the Caribbean. However, the Brazilian economy has reached a difficult point, and GDP per capita is expected to fall to as low as 7,447 U.S. dollars in 2016. As Brazil’s demographics are now similar to other developing countries, the economy has not been able to maintain a similar path to steady growth.